Fourteen year-old Doreen Green is back in this second adventure of Squirrel Girl. Her parents are a little more used to the idea that she has super abilities, but are still nervous parents. Her Best Human Friend Forever (BHFF), Ana Sofia, is also a friend of Thor, and Agents of SHIELD show up. Her Best Squirrel Friend Forever (BSFF), Tippy Toe, also joins in to help her solve the big mystery. So, Marvel's comic universe is in full swing in this delightful return to young Squirrel Girl adventures. For those who don't already know: Squirrel Girl has a tail like a Squirrel (but human sized) that she stuffs into her pants to pass as "normal", she can talk to squirrels, and she has the proportional strength of a squirrel. Squirrel Girl, while super strong, always tries to use her wit and intelligence before resorting to an actual fight. 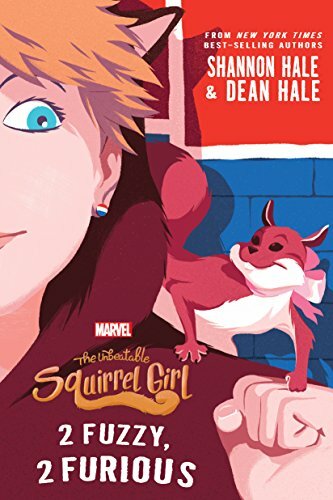 Doreen Green is just trying to navigate middle school as a normal kid while her super-hero persona, Squirrel Girl is so-popular the other students have set up a fan club that goes out on patrols to try to see Squirrel Girl in action. Everyone is excited about a new mall opening near town, but before the mall opens, Squirrel Girl needs to deal with LASER LADY. Bonus: There's a sub-plot here that feels like a nod to Jason Reynolds' book Miles Morales: Spider-Man, while taking the story in a very different direction. This may not have been on purpose, but I like to think that it was. In case it isn't clear, I highly recommend this book. I also suggest picking up the first book, but there's no references to the first book that are not explained in this second book. I bought this book at Forbidden Planet in Manhattan (after finding that The Strand didn't carry it). I got the original Unbeatable Squirrel Girl: Squirrel Meets World at Book Expo May 2016 (Chicago). I was also a regular reader of the Unbeatable Squirrel Girl comic series by Tom Taylor, art by Erica Henderson. I also admit that I stopped being a regular reader of the series when Erica Henderson stopped doing the internal art.